For over 500 years, Irish men, women, and children have crossed the Atlantic to Canada. Yet never during that time had people arrived in such great distress as those immigrants and refugees fleeing the Great Irish Potato Famine in 1847. During the famine period (1845-1851), a million or more died and a further million emigrated in the worst demographic catastrophe in nineteenth-century Europe. 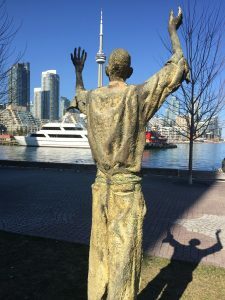 Famished Famine figure sculpted in bronze located in Ireland Park on the Toronto waterfront. It is a memorial to the nearly 40,000 people who arrived in the spring and summer of 1847, the vast majority of whom are Irish. 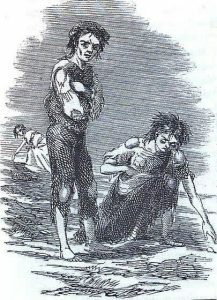 A two-day symposium, titled The Famine Irish and Forced Migration: An Early Canadian Refugee Crisis, will run from May 22-23, at the Archives of Ontario on York University’s Keele campus, and other locations. 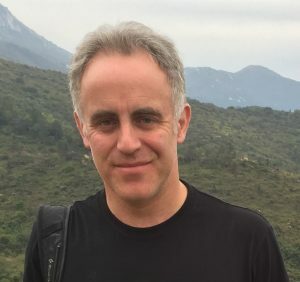 Organized by geography Professor William Jenkins, the symposium will feature speakers from the academic, heritage and arts sectors in Canada, Ireland, and the USA who are active in the production, curating, and promotion of knowledge about the Irish Famine. The speakers will consider the immediate and long-term impact of the arrival of Famine Irish forced migrants in the united Province of Canada, the experiences and perceptions of their Canadian caregivers, and their patterns of integration and resettlement in rural and urban communities. They will also consider how new scholarship about the famine is being brought into the public domain through museums, memorials, and online public history initiatives on both sides of the Atlantic. The panel of speakers includes current and recent graduates of the History graduate program at York. The keynote speakers are Professor Mark McGowan from the University of Toronto and Booker Prize-nominated author Michael Collins. McGowan will discuss his attempts to document the lives of hundreds of Irish orphans who were left stranded at Quebec City in 1847. Many were adopted by French Canadian families and by Irish migrants who had already settled in Canada. Collins ran a marathon-a-day along the Saint Lawrence Seaway from June 10 - July 10, 2016, retracing the 1847 passage of 100,000 Irish immigrants, who, upon processing at Grosse Île quarantine station, traveled onward to Toronto. He will present his thoughts on this unique experience. 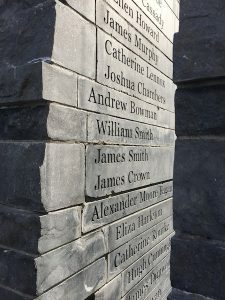 From the memorial that opened in 2007 in Ireland Park. Those who died shortly after arrival have their names carved on granite slabs at the site. The symposium comprises morning and afternoon conference sessions on both days at the Archives of Ontario, including a documentary screening and the performance of a one-woman play. On the evening of Day 1, the Great Famine Voices Roadshow open access oral history workshop will take place at St. Michael’s College, University of Toronto. 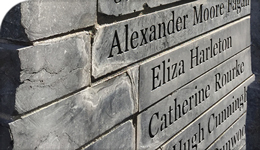 In the late afternoon and evening of Day 2, there will be a field trip to the Irish Famine memorial at Ireland Park on the Toronto waterfront, and a closing reception at Biagio Ristorante downtown. The scene at Skibbereen, west Cork, in 1847. From a series of illustrations by Cork artist James Mahony (1810-1879), commissioned by Illustrated London News 1847. The symposium has been generously sponsored by a number of York-based sources: the Division of Vice-President Academic & Provost; the Office of the Vice-President, Research & Innovation; the Faculty of Liberal Arts & Professional Studies; the Robarts Centre for Canadian Studies; the Centre for Refugee Studies; the Avie Bennett Historica Chair in Canadian History; and the City Institute. It has also received sponsorship from the Irish Heritage Trust, the Irish National Famine Museum, and the Virtual Museum of Canada. Those interested in attending should contact Professor Jenkins at wjenkins@yorku.ca.